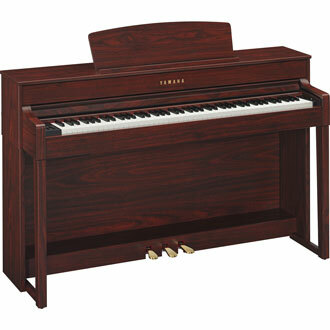 The Yamaha CLP-545 offers powerful sound and the new NWX keyboard with synthetic ivory keytops. This keyboard features solid wood construction with escapement similar to that used in a grand piano keyboard, delivering authentic touch. The CLP-545 includes 2-way speakers with dedicated drivers for mid and high-frequency ranges that provide astonishingly powerful sound. Plus, you can now pick from any number of high quality Rhythms, including various jazz, pop and latin patterns, to add new dimension to your performances and enhance your timing. The CLP-545 offers the CFX and Bosendorfer Imperial piano samples, 256-note polyphony, 16-track recording, a USB Audio Recorder, and over 300 exercises for building piano technique from Hanon, Bayer, Czerny and Burgmuller. You can also connect your iPhone, iPad or iPod touch wirelessly! *The CLP-545 is also available in Polished Ebony, Black Walnut, Dark Rosewood and White.